While stem cells are now being utilized in products applied topically to the skin, they aren’t embryonic, or human cells. Rather, skincare experts are incorporating plant-derived stem cells combined with special peptides, which are producing amazing anti-aging and protective properties for our skin. Among the first crèmes to use dual strain stem cell technology, Apple and Leontopodium, the Max crème works on skin to correct the signs of aging as well as to prevent further damage done by the sun, free radicals, and genealogy. Maintenance of the extracellular matrix keeps skin structure healthy and intact. The combination of Argireline® and multi-peptides offer Botox® like inhibition of muscle contraction, while preventing the formation of wrinkles and fine lines associated with repetitive movement by modulating muscle contraction. Skin is smoothed, hydrated, protected and balanced. This gentle cleanser was formulated to balance as well as optimize your skins PH. Sulfate-free, Paraben-free, and Acid-free it contains the plant-derived stem cells from Grape, Edelweiss, and Leucojum Aestivum aimed at slowing the aging process while extending cell life. Oat Kernel soothes and prevents redness; Hydrolyzed Rice Protein promotes collagen synthesis. A corrective peptide blend rejuvenates eyes day and night. Plant stem cells derived from Grape, Edelweiss, and Apple protect and prevent from further damage. 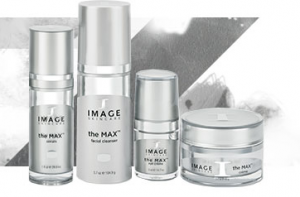 Prevents cells from aging, reduces puffiness and inflammation. Looking for the best anti-aging products that will correct, prevent, and nourish your skin. Look no further than MAX. Brighten Up! Banish Age Spots And More With Ageless Total Skin Lightening Serum.